If you’ve been spending hours with the digital calipers while designing enclosures for your circuit boards there may be a better way. [Phil] tipped us off about a new software package that will let you import PCB layout files into Google Sketchup. This way you can start working on the enclosure in CAD before you’ve populated your first board. Of course this adds to the pain of realizing there’s an error in your layout, but what are you going to do? The free software was developed by RS Components, a European component distributor. It takes IDF files, which can be exported from most PCB design software, and converts them to a format compatible with Sketchup, Google’s 3D design software. For those who enjoy a very dry demonstration video you won’t want to skip seeing what we’ve embedded after the jump. We’re kind of surprised that this hasn’t already been done. If it has, leave a link in the comments. We have to export our PCB’s as a DXF file, then import into ProE. Why would you ever use Google Sketchup? Robot, i sent a mail to Dassault Systémes SolidWorks Corp (the new tongue twister corp) about them making solidworks available on a per month basis like photoshop. No reply yet. Why wouldn’t one use sketchup? Don’t dis Sketchup before you’ve tried it! We started messing around with it a few years ago, and now we do all our detailed product design in it (having built a library of all our parts). Seetrax Designer XL PCB exports 3D DXF, stright into Sketchup & into the job. We use SU for design, build info and publicity shots. See the results on http://www.trtest.com. Not perfect, but great value for money. My employer has been doing this for some time. We’re a half Altium / half Autodesk Inventor design shop, so we take Altium PCB models, use Altium’s built-in Export as STEP tool, and import into Inventor. Works like a charm. Plus both Altium Designer and Autodesk Inventor are infinitely scriptable, so you can add all manner of pre- and post-processing to your designs. 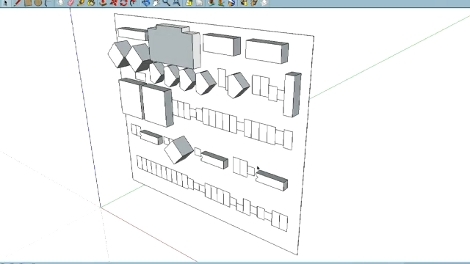 Just export a jpeg of the board layout, import it to sketchup and extrude shapes over the components that are most likely to get in the way. Precisely. It is actually a very powerful tool. For instance, if you make a rough representation of a bolt, you can then make it a component, then copy it ad infinitum to represent the bolt that you’re going to use in your machine. Then you can take one of those copies, and refine the shape to better represent the real bolt you’re going to use, and it changes all of them. It’s a 3D sketching up tool. I just drew a CNC machine with it by drawing one linear bearing mechanism, first as a rough sketch, then aligned three copies up for the assembly, then refined the sketch to better represent the actual parts I’m going to use, and I didn’t have to redraw the entire model just because one bolthead was actually two millimeters narrower than I thought it would be. Here’s the concept drawing made in Google Sketchup. The point is that you could make that without any machining tools beyond a drill and a drill press stand, and the parts should cost you less than a hundred euros if you’re lucky. Though there are some problems with the design. The gap between the runners is too shallow for the edge of the L strip to run in so it slips off if you put any force on it, so I’ll have to widen the gap between the rollerskate bearings and turn the L strip into a wedge between the gap somehow. I’m trying to figure out how to turn a piece of plastic into a wheel with a groove, that sits around the bearings. Wow, I needed to do this recently because my office is 3000 miles away from the guys with solidworks seats, so every time I wanted to check my work, I had to send it over to them and have them import into SW and send me jpgs back. I had started a sketchup plugin to import these files simply so I could see the IDF output. It’s not hard and wondered why no one did it before. This will help greatly when verifying the parts before I send it to the mechanical guys. @Dax I think you also need more support for the drill, just holding it at the neck with a thin L shape does not seem smart and sold and stable, it will twist and vibrate and ruin the results I expect. Also you need to think about where the powercord and such is going to go, it needs something to guide and hold it. Absolutely need more support for the drill – but great idea nonetheless. We actually design and build PCBs so this was a pretty interesting article.